The Serene Stamper: Stampin' Up! Spring Catty and Saleabration Inspiration! Stampin' Up! Spring Catty and Saleabration Inspiration! Hi Friends! One of the best things about being a Stampin' Up! demonstrator is being able to attend their AMAZING events, such as the Leadership Conference I went to last month. My head is STILL spinning from the fabulous demonstrations, classes, card swaps, new product booths, etc. I just want to stamp 24/7 and recreate everything I saw! Shop 24/7 through my online store to purchase any of the above item ~ just click HERE! 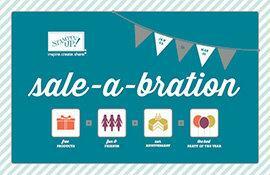 Check out my special Sale-a-Bration Kits!